This morning's royal wedding reminded me of a popular TV show several years ago. Based one a comic book, Palace(Goong) illustrated an imaginary lives of royal people in Korea. Until the early 1900s, there was Korean dynasty existing, but due to the invasion Japan, most of them were killed, and others ran way to other countries. This show is a fiction, base on the idea about how it would be if the dynasty was still existing. At the beginning of the show, the prince and his family look for a bride, and a common, middle classed high school girl is chosen as his mate. Rest of the show is about their lives in palace. Here's the synopsis from DramaWiki. Goong is a story about young love in face of tradition, politics, and intrigue. In the imaginary world, modern-day Korea is a constitutional monarchy and the Royal Family lives in a grand Palace, the Goong. Story opens with the sudden death of the reigning the King. Faced with the decreasing popularity among the public for the Royalty, a grand wedding for the Crown Prince, Lee Shin, is decided to be the best publicity move to improve the image of the Royalty and at the same time prepare Shin for immediate succession. The intended bride? The headstrong, awkward, and sweet spirited Shin Chae Kyung that just happens to go to the same exclusive art school. Chae Kyung was betrothed to become the next Crown Princess by her grandfather and Shin's grandfather. After 14 years of living in England with his mom, Lee Yul appears all of a sudden. He is Shin's cousin as well as the former Crown Prince. Everything seemed to be going normally until Chae Kyung's optimistic spirit wins the heart of internally lonely, Yul. As the Crown Prince Shin and simple-minded Chae Kyung's relationship appear to developing deeper feelings, a series of scandals are exposed to the public right after the pair were officially announced married. Will love prevail all in a world of political pressures and martial hardships? Or will being in the spotlight of the public be too much for the young newlyweds to endure? 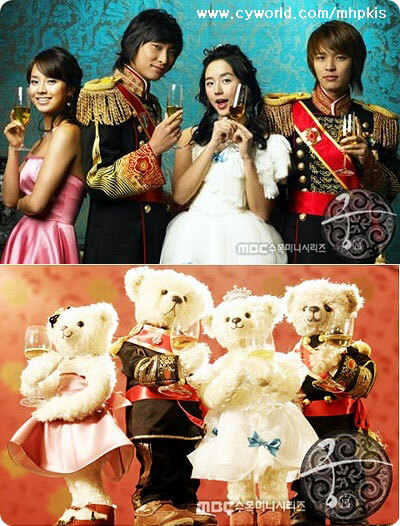 This show was popular, especially among young girls in Korea, because it gives the fantasy of royal lives to them. However, what attracted me about this show was the outfits the casts were wearing. In the palace, the royal family were Korean traditional outfit, hanbok. Hanbok itself is pretty too, but what the main character was wearing was the modern version of hanbok, which was new and interesting. Her clothing gained popularity, and that affected on huge popularity of the teddy bears with her clothes. Even though Korean culture is not welcoming people wearing hanbok unless it is a special occasion, but it was nice that this show helped the tradition gain some popularity.